Bureaucratic red tape is preventing two planes modified for aerial firefighting from combating the wildfires raging today in California. A DC-10 and a Boeing-747 “Supertanker,” specially equipped with firefighting technology, have been waiting for days for the U.S. Forest Service and FAA to approve them to fight the rapidly spreading wildfires that have already consumed 84,035 acres. Local residents are furious about the idle equipment that could potentially save their homes. “This is ridiculous. The Lockwood valley is already under a voluntary evacuation order, and there are a lot of elderly people living up there,” said one resident who lives near Lockwood Valley, an area threatened by the fires. NBC still doesn’t like Star Trek. At least, judging by treatment KNBC Los Angeles gave “Balance of Terror,” the first episode of the gussied up CGI special edition. Maybe it’s because NBC is still a bit jealous they let the damn thing go in the first place, or maybe it’s because the show is now owned by CBS (through CBS/Paramount). First of all, despite news stories and articles in the mainstream press about the 40th anniversary of Trek and the CGI work done to spruce it up, KNBC did NO promotion of the show at all. They aired it at 12:05 Monday morning, the same airtime they gave the late but not lamented Star Trek: Enterprise reruns. Moreover, there was no notice in the show descriptions given to TiVo, DirecTV and other services that this re-run was in fact the new CGI-improved version. But even worse, KNBC went through the trouble of editing the shows, cutting whole scenes out, even some of the new effects shots. Almost all of Kirk’s speech with McCoy in the captain’s quarters, a fine example of 60’s television writing, was excised, all so they could fit commercials into the allotted airtime of 58 minutes — not even a full hour. The new effects themselves were a bit more subtle than I expected, and the reasoning may have been that even though CBS/Paramount wished to apply modern technology, they didn’t want to mess with the cheesy spirit of the original. I was expecting more, but I can understand why they didn’t. Or maybe it was budgetary… who knows? 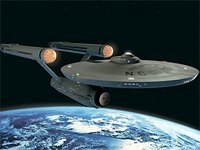 My one complaint about the new Enterprise is that, despite the hype, it looks obviously computer generated. That’s still an improvement, mind you, but CGI effects in other sci-fi shows have been better. The Romulan bird of prey was quite gorgeous however — all the spaceship scenes are at least much brighter, clearer and sharper. But the best, most beautiful effect of all was the comet in one key scene, even though KNBC cut the opening shot of it. The episode itself is a classic one of the series, a re-telling of two World War II submarine movies, “Run Silent Run Deep” and “The Enemy Below,” with the Romulans taking on the role of Nazi subs, their cloaking device a metaphor for being able to “hide” under the ocean surface. There are a few faults in the story — would a captain hug a yeoman on the bridge? Yeah, but there’d be hearings afterward. Also the scene where a lieutenant is quite disrespectful of a superior officer but with hardly a reprimand. But overall a fine story and well-acted, much better than what Trek would later become by its third season campfest. And at this point in the series it was still an ensemble piece, not so much the “Kirk and Spock Show” it turned into. Surprising to me was that they didn’t improve the onscreen graphic showing the neutral zone outposts. They also didn’t fix an infamous continuity problem — the “phaser” shots were actually “photon torpedo” shots, but since this was the first time in the show’s run they’d shown the Enterprise firing phasers, the original producers can’t be faulted. (Technically it would be LATER episodes that broke the continuity, but that’s a philosophical argument.) Then again, this may be another sign of CBS/Paramount wanting the maintain the spirit of the original without giving it a whole Lucas/Star Wars version 8.0 treatment. And then there’s the later-discarded notion that ship phasers had to be fired from another control room and not from the bridge, but again at this time they’d never shown the ship firing phasers before, and I suppose the original writers wanted to maintain the metaphor of the old submarine war movies. All in all, it was enjoyable to see an old episode given a new paint job. But KNBC’s treatment of it is inexcusable. They could have spent just a little time promoting it and gotten more viewers. They’d have more integrity letting another station pick Trek up and show an infomercial instead. I’m curious to watch future shows and see how they turn out. Oh c’mon, you know it’s cute. Please indulge me in a bit of geekiness. Star Trek TOS returns to broadcast television this week with an extensive digital face-lift. CBS Paramount Domestic Television is digitally remastering all 79 episodes of the original series to enhance the show’s 60s-era visual effects with 21st-century CGI. Digitally created images will replace the scale models used for exterior shots of the spaceships. Galaxies and planets also will be touched up to give them greater depth. The flat matte paintings used as backdrops on planet surface sets will be enhanced to add texture, atmosphere and lighting. A friend of mine said that TOS was “sacrosanct” and shouldn’t be messed with. I replied, Trekkie though I am, that it’s still just a TV show, the originals will always be there, and that I was still interested in seeing how it’ll look. After all, the TVs we have today are infinitely better than the ones they had in the 60s. And recently rewatching some of the episodes on DVD on my LCD big screen was impossible without being distracted by things like — oh, Spock’s plastic ears about to fall off. Coming soon… an announcement of a brand new show starting September 25 starring Yours Truly. Stay tuned.